The AdMaS Center, in cooperation with 3i – Isolet, s.r.o., participates in the solution to increase safety on construction sites. Falling into shafts, skylights, passages or other openings in ceiling or other horizontal structures is one of the risks during construction. The solution consists in securing these holes in a monolithic horizontal structure. Instead of building up ramps and temporary railing around these holes, SAFETY BLOCK is inserted into the hole, filling the space for the future opening in the ceiling structure. Subsequently, after hardening of the monolithic structure, the block is removed completely or partially as needed. 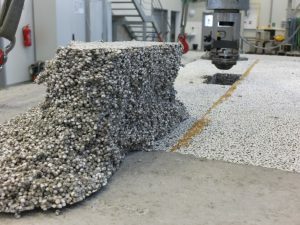 In the AdMaS Center have been verified mechanical properties which are related to the possibility of walking on the embedded blocks in the monolithic structure, and the secure transfer of load that can be derived by moving workers during construction. In load tests, which should simulate the feet of the human leg, a very high load capacity has been achieved. Due to testing in the center of Admas, safety has been verified in terms of load bearing capacity, even on joints of boards bonded together with polyurethane foam or building cement based adhesive. This is a very interesting solution to increase safety on site.